Jaycee is a self-confessed Rebellious Brides reader. Not just her, but her church group! Yes folks, our rebellious ways have infiltrated the church--just kidding. 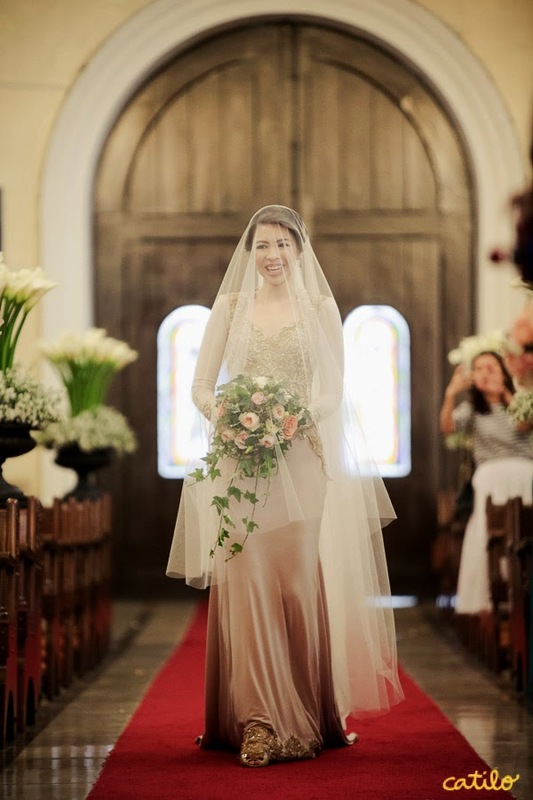 Apart from the fact that Jaycee got Madge Lejano as her makeup artists because of our blog, one of the things that was really a labor of love for her was her rebellious gown--a gown that she says, she kept a secret from everybody. And that kind of thinking was something she picked up from the blog too. We are so proud! 1) It had to be "Mahinhin na Malandi" (Demure but Coquettish) - meaning it could look traditional (and should pass church standards) but it should definitely have my signature --- I was never a fan of frou frou or ball gowns and I also love clothes that hug my curves. 2) It had to be something that I can have altered after so I can re-use it as a formal evening gown in the future. Hence, white would definitely not work and the fabric had to be light. Lastly, I couldn't stomach paying a lot for something I'm gonna store in a box after just a one-time use. It’s just not aligned with my practical mentality. 3) I also wanted it to be gold but according to Debbie Co it had to be a certain shade of gold since gold lace may make me look old or may make the dress look old. It was challenging at first because Debbie had to look for fabrics and lace for the appliqués that would approximate my peg abroad. We had to email / text each other so I can also check the options available in Korea. Debbie was super collaborative although to be honest there was a point where I wanted to give up on the gown design because it was just really taking some time to put it together. The blue sapphire diamond earrings RJ gave me as a wedding gift blended very well with the Swarovsky crystals and it served as a breaker and accent for my whole look. Debbie said I am her only bride that used jersey for a wedding gown. So happy that everyone loved my gown especially ME! 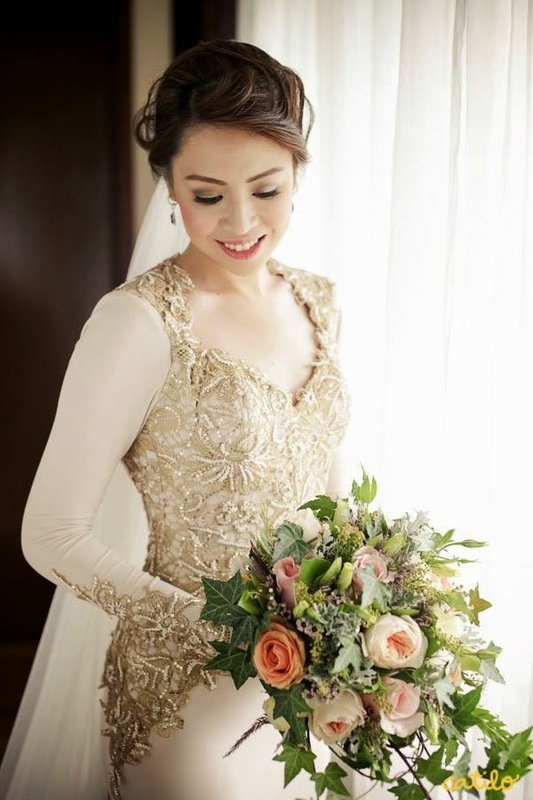 :)"
We hope that Jaycee's story inspires you to go for the wedding gown of your dreams--white or colored, at the end of the day it should be something that you honestly know in your heart reflects who you are and not what society tells you what you should wear. Congratulations once again Jaycee and RJ!